I left Norwich by the back door, along the former Old Catton high street which becomes a perimeter lane to the east of the airport. The only people about on this Saturday morning were a handful of plane spotters, their cars pulled tightly up onto the verge, their binoculars trained. They were escaping the everyday shopping madness of central Norwich as much as I was. As I cycled on, a large blue aeroplane came into land, flying low over the high-hedged field and then right over my head, so close that I could see the tread on the tyres. A huge boom of noise filled the air, and then faded suddenly. I suppose that locals must get used to it. The lane meandered away from the airport, disgorging me onto the Buxton road, and then I was in Spixworth, surprisingly large and suburban. 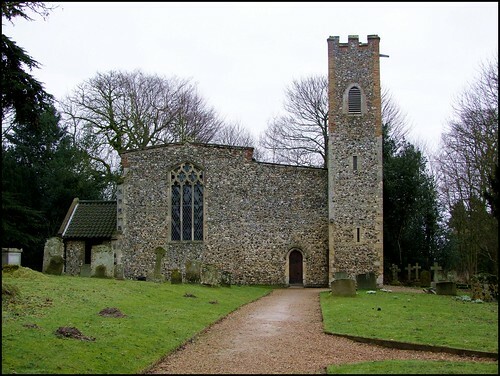 I headed on, and the busy road curved down into an older part of the village - suddenly, it was pretty, and there was Spixworth's idiosyncratic church set back from the road facing some cottages and a farm across the junction. It is a church so small that it seems to have joined in the conspiracy to escape attention, Arthur Mee noted when he came this way in the 1930s. And St Peter is a very odd sight, as Pevsner observed. The narrow, pencil-like tower is in the extreme south-west corner, an aisle separating it from the west end of the nave. The tower is older than everything else - presumably it came from an earlier church, although it is hard to see how it can ever have been anywhere other than the south-west corner. The nave and chancel appear all 14th Century, the aisle more than a century later - as Pevsner notes, it appears to coincide with a 1499 bequest for a south porch, but this was never built. The arcade between nave and aisle is also late 15th Century, suggesting that, unless the former church was demolished for the aisle to be built, tower and church were separate from each other for more than a century. There is an entrance at the west end of the aisle, an ununusual arrangement to say the least. Part of the churchyard has been set aside for walks, and on this February day it was full of snowdrops, a pleasant place to wander. And this is a very friendly church: a sign inside announces that you are always welcome here, whether you have faith or not. How lovely that is. They certainly expect visitors, because almost everything has a notice on it, explaining what it is, how old it is and what it is for. The most exciting feature of Spixworth church is the memorial up in the tiny chancel depicting two life-size corpses in their shrouds - now, there's something you don't see everyday, either. The figures (represented naturalistically as dead - Pevsner) are William and Alice Peck. William died in 1635, a time of great piety, both Laudian and Puritan - the ornate pediment and elaborate Latin inscription suggest that the Pecks were of the former party. A rugged Norman font is topped by a finely-carved modern cover in the Classical tradition. It remembers a mother and daughter who both died in 1967. Nearby are deposited the remains of William Feltom late of Sprowston. His inscription notes that the man whose memory this marble perpetuates performed the relative duties of a Christian with fidelity. Beside it is the church's large royal arms, plainly a set for Charles II, but recharged and relettered for George I.
I was here on a rather dull day, and it was a little gloomy inside St Peter, not least because of a considerable amount of stained glass. This isn't bad - the angels greeting the women at the empty tomb is nice, but the best of all is in the east window of the south aisle. It depicts Faith, Hope and Charity, the last in the middle. There is nothing triumphalist about them, their faces a mixture of piety and quiet determination. It's super. I wonder who the artist was? Victorian furnishings fill the nave, chancel and aisle, and it is easy to imagine this place in the late 19th Century, the local ploughboy and blacksmith shuffling uncomfortably on their benches as the Minister gives his afternoon sermon. Today, I sat in the half-light and listened to the birds outside, until at last another aeroplane thundered through the silence. What a lovely little church, I thought to myself as I headed on northwards; a quiet, slightly cluttered space sustained by a sense of the numinous which lifts the heart. I was glad it was my first church of the day.